There are a lot of wireless controlled bulbs and sockets in the market nowadays, such as GE Link connected bulb, and Belkin Wemo socket. However their communication with the mobile phone app is only one-way, and they cannot provide feedback of their working conditions. Because those wireless controlled bulbs and sockets lack of two-way communications with the mobile phone app, so they cannot be considered as "Intelligent" devices. 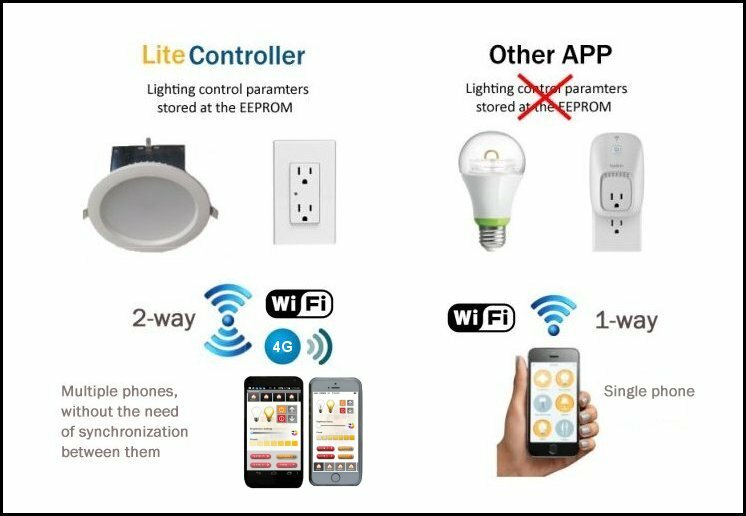 LiteController offers the following three technological advancements over the wireless controlled bulb and socket, so that the luminaires and devices can work intelligently and more effectively. Our Wi-Fi mobile app, DaliSuites, can communicate with the luminarie/device bi-directinally. The user can retrieve the current status of luminaire/device by local Wi-Fi and 3G/LTE network, and this feature is especially helpful when the user is away from home. Upon receipt of the feedback status, the user can use DaliSuites to adjust the setting accordingly. In this way, the luminaire/device can offer intelligences as compared to the wireless controlled bulb and socket. The lighting control parameters (such as, Group, Scene, Fade setting specified in DALI protocol) are stored at the EEPROM of each luminaire/device. Therefore multiple Wi-Fi mobile devices installed with DaliSuites can control the luminaires/devices at the same time and without the need of synchronization between them. Also one luminaire/device can belong to multiple Groups, and it can be set with multiple Scenes. Therefore DaliSuites offers higher flexibility and user-friendliness. DaliSuites works with the luminaire installed with a LED driver producing 1000-5000 lumen, while the wireless controlled bulb can only produce 800-1000 lumen due to limited thermal dissipation capability.